It's been yet again so long since my last update. I have been meaning to write a new blog post but I got sooooo busy with work in the start of January that I had no time to do anything. Like seriously, I didn't even have time to sleep. I was running on 4 hours of sleep everyday for 2 weeks straight. My body feels so exhausted!!! Hopefully work will be a little less busy in the upcoming weeks so I can get more rest and get on with actually doing some of my new year resolutions. Like exercising daily and take at least one self-portrait for this month. Anyway, I wanted to share this outfit I put together that's extremely comfy and warm to wear on those cold days during the winter for a home/room wear kind of look. I was actually inspired by Otsuka Ai's outfit in a music show where she performed the song "Pocket". I modified the outfit a bit since I didn't have the exact same things she wore for the performance but I tried to be as close as I could get in mimicking it with what I have in my closet. I actually only realized this after I took all my outfit snaps that I forgot to wrap my scarf around my neck once. No wonder I thought it looked a bit strange when I finally imported my photos to my computer to edit them. *total fail* LOL! And I tried to wrap my hair up in a bun and couldn't get it to work. I have very fine, thin and light weight hair. It takes about over 20 pieces of hair put together to make a strand of a hair for me so you can imagine how thin my hair is. I also have no volume to my hair at all and I have very little hair to begin with. When I tried to tie my hair up to make it into a bun, my bun ended up being the size of my thumb finger. It looked as if I have no hair at all! I tried to make it into a bun for about 30 minutes and couldn't get my hair into a big bun and in the end I just decided to leave it in a pony tail instead. But actually even Otsuka Ai doesn't have enough hair to create that voluminous and big bun she has on top of her head. It is actually a fake hair bun that she has on top of her head. I love how she's wearing this really long scarf with feathers attached to them that make it so pretty and winter-y. I didn't have white feathers to attach to my scarf so I wore these white with black polkadots feather earrings that I have. It was as close as I could get! 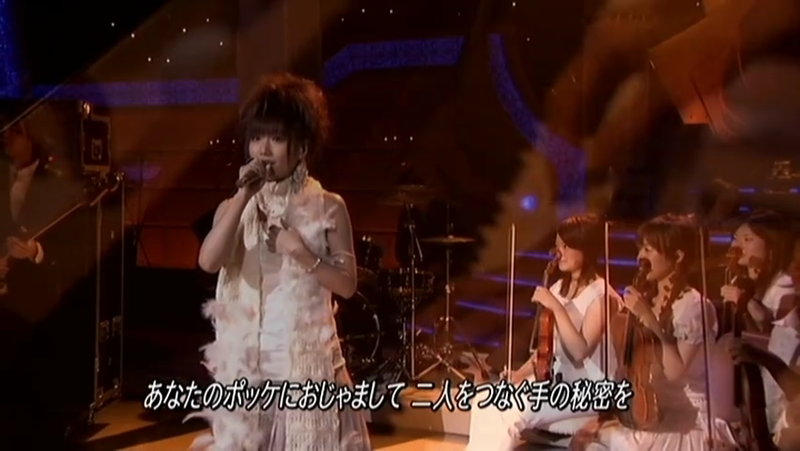 Here are some screencaps from Otsuka Ai's performance outfit for you to compare.